Ahypopyon results from the accumulation of leukocytes/pus in the inferior anterior chamber (AC) with a horizontal upper margin as it is heavier than aqueous. In contrast, an inverted hypopyon is seen superiorly, resulting from emulsified lighter silicone oil., Posterior segment hypopyon involves the subhyaloid/subinternal limiting membrane (preretinal) space or subretinal space and is usually a sign of ocular inflammation secondary to infection. Subretinal hypopyon may be seen in bacterial endophthalmitis, fungal endophthalmitis, and acute retinal necrosis. Subretinal hypopyon-like appearance (pseudohypopyon) can occur due to the inferior accumulation of tumor cells (like leukemic cells) or lipofuscin in prolymphocytic leukemia or Best disease respectively. Other causes of subretinal pseudohypopyon include acute idiopathic maculopathy, sympathetic ophthalmia, choroidal nevus, and secondary syphilis. Causes of preretinal (subhyaloid or subinternal limiting membrane) hypopyon include resolved subinternal limiting membrane bleed,(pseudohypopyon after Valsalva retinopathy or Terson syndrome), and syphilis. The authors present two patients with subretinal hypopyon who responded well to antitubercular therapy (ATT). An immunocompetent 47-year-old male presented with visual loss in both the eyes for 2 weeks. The best-corrected visual acuity (BCVA) was 6/60 in the right eye (RE) and 1/60 in the left eye (LE). The intraocular pressure was 10 mmHg in both the eyes. AC showed nongranulomatous keratic precipitates and 2+ cells in both eyes. Retrolental cells were present bilaterally and both the eyes showed mild vitritis. The RE showed disc edema with surrounding peripapillary chorioretinitis with associated neurosensory detachment [Figure 1]a. A subretinal hypopyon was also noted inferior to the disc along the lower extent of the subretinal fluid [arrow, [Figure 1]a. 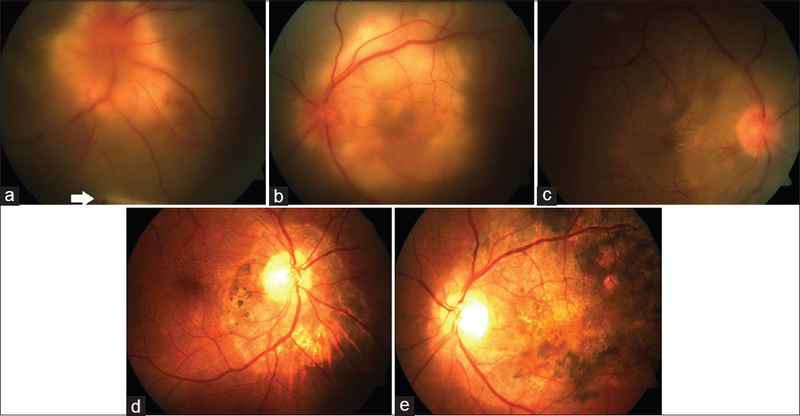 The LE had a similar picture with the chorioretinitis involving a larger area extending from the peripapillary region to the macula [Figure 1]b. The extent of involvement and the elevation of the retina with the presence of significant amount of turbid subretinal fluid were indicative of abscess formation in the region of the chorioretinitis. Hemogram was unremarkable. HIV antibodies and Venereal Disease Research Laboratory were negative. The Mantoux of this patient was 12 mm at 48 h. A contrast-enhanced computed tomogram (CECT) of the chest revealed multiple lymph nodes in the chest and neck region. Biopsy from one of the cervical lymph nodes revealed acid-fast bacilli. Based on this, the patient was started on topical steroid, cycloplegic, and ATT (isoniazid, rifampicin, ethambutol, and pyrazinamide), and he responded well to it. The RE developed a macular star during resolution [Figure 1]c. The chorioretinitis and the hypopyon resolved in about a month leaving areas of altered pigmentation [Figure 1]d and [Figure 1]e. Both the eyes showed Kyrieleis' plaques,, (or segmental arteritis) and multiple round vitreous debris during resolution. At 1-month follow-up, the BCVA improved to 6/12 in the RE and 2/60 in the LE. The vision in the RE improved significantly as the fovea was spared. The systemic disease component also regressed following ATT. Another immunocompetent 17-year-old young Indian male presented with rapid visual loss in the RE for 2 weeks. He had a presenting BCVA of finger counting close to the face with accurate projection of rays in the RE. LE vision was 6/6. He was noted to have 6/24 in the RE few days back. Intraocular pressure was 14 mmHg bilaterally. There was no redness or congestion in either eye. There was a relative afferent pupillary defect in the RE. The RE had 3+ AC cells with retrolental cells. There was no significant vitritis. The right fundus showed disc edema with a focal patch of chorioretinitis adjacent to the disc, macular neurosensory retinal detachment continuous with the peripapillary detachment [Figure 2]a. Radial orientation of hard exudates around the fovea was noted giving rise to the appearance of a macular star [Figure 2]a. There was an inferotemporal choroidal granuloma with surrounding gravitating exudative neurosensory retinal detachment. The subretinal contents gravitated down to the bottom of the area of the neurosensory detachment forming a subretinal hypopyon with a flat horizontal upper margin [Figure 2]b. The fundus of the LE was unremarkable. Optical coherence tomography (OCT) through the fovea revealed a neurosensory retinal detachment with intraretinal cystoid changes [Figure 2]c. OCT scan through the chorioretinal granuloma revealed a hyporeflective mound in the choroid with contact between retinal pigment epithelium–choroid complex and neurosensory retina over it (“contact sign”). Anterior to the choroidal mound, low-to-moderate intense hyperreflectivity was seen at the level of the outer retinal layers. There seemed to be a separation of the intact Bruch's membrane and the retinal pigment epithelium at this level. The inner retinal layers were also hyperreflective with overlying vitreous cells [Figure 2]d.
Hemogram, erythrocyte sedimentation rate, angiotensin-converting enzyme, and peripheral blood smear were normal. Serology for human immunodeficiency virus and syphilis was negative. CECT of the chest was reported normal. Mantoux was positive. Clinically, there were no detectable lymph nodes. A visual evoked potential was done which showed reduced amplitude and increased latency in the RE. Empirical ATT alone was started in view of rapid deterioration of vision, ophthalmoscopic features suggestive of tuberculosis, and our previous experience of case 1. The patient also received topical steroid and cycloplegic in the right eye. Within a week, there was a dramatic anatomical response to therapy. The disc edema reduced with marked reduction of the peripapillary chorioretinitis [Figure 2]e. The macular star became more prominent. The neurosensory retinal detachment and the choroidal granuloma also regressed significantly [Figure 2]f. There was subretinal hemorrhage surrounding the granuloma [Figure 2]f. By 3 weeks, there was complete anatomical resolution apart from the slowly regressing macular star [Figure 2]g. OCT through the inferotemporal granuloma scar showed resolution of the choroidal mound with focal loss of retinal pigment epithelium and outer retinal layers with thinning of the overlying retinal layers [Figure 2]h. The vision, however, did not improve in this eye. The choroidal tubercle is a known manifestation of direct ocular invasion by Mycobacterium tuberculosis. When large in size, it is called a tuberculoma. Tubercular subretinal/choroidal abscess is a larger yellowish lesion which may change location with the position of the head and is associated with a neurosensory retinal detachment. Apart from a tubercular granuloma or an abscess, both of our cases had a subretinal yellowish deposit with a horizontal upper border suggestive of hypopyon. The presumed etiology in our cases was tuberculosis which was supported by a good clinical response to ATT and typical ophthalmoscopic appearance. In case 1, Mycobacterium bacilli were also identified on biopsy of a cervical lymph node. Tubercular subretinal abscess is a well-recognized entity, and after resolution, it results in a scar at the location(s) of the choroidal tuberculoma(s). This may also predispose to formation of a choroidal neovascular membrane. Subretinal abscess may be a feature of intraocular infection with other bacteria, fungi, and even viral retinitis. Mimickers of subretinal abscess are massive choroiditis, central serous chorioretinopathy with dense subretinal fibrin, posterior scleritis, large sarcoid granuloma, subretinal masses (including choroidal hemangioma and metastasis), and resolved subretinal bleed. A subretinal hypopyon forms when the yellow necrotic materials or white blood cells precipitate due to gravitation. It may possibly be seen in other causes of subretinal abscess formation as well. Time-domain OCT features of choroidal tuberculosis have been described before by Salman et al. We found similar features on the spectral-domain OCT scan taken through the chorioretinal lesion. In addition, we noted a separation of the Bruch's membrane from the retinal pigment epithelium at the margin of the lesion. The presence of a subretinal hypopyon in cases of tubercular subretinal abscesses or tuberculomas has not been reported earlier according to the best of our knowledge. Infective causes should be ruled out in cases with subretinal hypopyon, and the disease usually responds to the causative antimicrobial agent. The presence of an associated chorioretinal granuloma/abscess in cases of a subretinal hypopyon may point toward a tubercular etiology. Ethics approval and consent to participate: Consent of the patients was obtained. Tripathy K, Sharma YR. Inverted hypopyon in the eye. BMJ Case Rep 2016;2016. doi:10.1136/bcr-2016-214638. Tripathy K, Chawla R. Inverse hypopyon (hyperoleon) at the posterior segment in pathological myopia. BMJ Case Rep 2017. doi:10.1136/bcr-2017-223416. Venkatesh P, Temkar S, Tripathy K, Chawla R. Intralesional antibiotic injection using 41G needle for the management of subretinal abscess in endogenous endophthalmitis. Int J Retina Vitr 2016;2:17. doi: 10.1186/s40942 016 0043 x.
Kurup SK. Ophthalmic images: Subretinal hypopyon in acute retinal necrosis. Arch Ophthalmol 2007;125:1133. Fish RH, Territo C, Anand R. Pseudohypopyon in unilateral acute idiopathic maculopathy. Retina Phila Pa 1993;13:26-8. Dai R, Zhang M, Dong F, Zhang Z, Chao W. Subretinal hypopyon in sympathetic ophthalmia. Ocul Immunol Inflamm 2009;17:101-3. Naseripour M, Shields CL, Shields JA, Guyer DR. Pseudohypopyon of orange pigment overlying a stable choroidal nevus. Am J Ophthalmol 2001;132:416-7. Ouano DP, Brucker AJ, Saran BR. Macular pseudohypopyon from secondary syphilis. Am J Ophthalmol 1995;119:372-4. Tripathy K, Chawla R. Valsalva retinopathy. Natl Med J India 2015; 28:310. Tripathy K, Chawla R, Vekaria L, Sharma Y. Sub-internal limiting membrane cavity following valsalva retinopathy resembling central serous chorioretinopathy. J Ophthalmic Vis Res 2018;13:83. Sihota R, Paul AH, Chandna R. Preretinal 'hypopyon'. Br J Ophthalmol 1997;81:91-2. Chawla R, Tripathy K, Sharma YR, Venkatesh P, Vohra R. Periarterial plaques (Kyrieleis' arteriolitis) in a case of bilateral acute retinal necrosis. Semin Ophthalmol 2017;32:251-2. Tripathy K, Chawla R, Sharma YR, Vohra R. Rickettsia retinitis cases in India: A few comments. J Ophthalmic Inflamm Infect 2016;6:7. Bisighini SL, Pagliuso LM. Retinal vasculitis: A diagnostic dilemma. Clin Eye Vis Care 1997;9:71-84. Jain IS, Singh K. Segmental arteritis. Indian J Ophthalmol 1966;14:229. Salman A, Parmar P, Rajamohan M, Vanila CG, Thomas PA, Jesudasan CA, et al. Optical coherence tomography in choroidal tuberculosis. Am J Ophthalmol 2006;142:170-2. Tripathy K, Chawla R, Sharma YR. Intravitreal bevacizumab for choroidal neovascular membrane at the edge of a healed choroidal tuberculoma. Ocul Immunol Inflamm 2018;26:239-41. Venkatesh P, Chawla R, Tripathy K, Singh HI, Bypareddy R. Scleral resection in chronic central serous chorioretinopathy complicated by exudative retinal detachment. Eye Vis Lond 2016;3:23. doi: 10.1186/s40662-016-0055-5.